Hungry? Want something to eat? Try one of the best Italian restaurants in New Jersey, Carmen's Trattoria. Carmen's Trattoria has established a reputation for providing the highest quality food, excellent customer service and speedy delivery to customers in the Central Jersey area. We can promise satisfaction because all dishes at Carmen's Trattoria are freshly prepared every day with premium ingredients. Speaking for the entire staff at Carmen's Trattoria, we appreciate our customers for their loyalty and past patronage. Going forward, we promise to maintain the same high quality operation to serve you in the future. 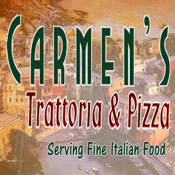 Location Information: Easily find Carmen's Trattoria location with turn-by-turn directions or call us with “one touch” dialing. Enjoy Videos, Italian Music and other music thru our app music player.